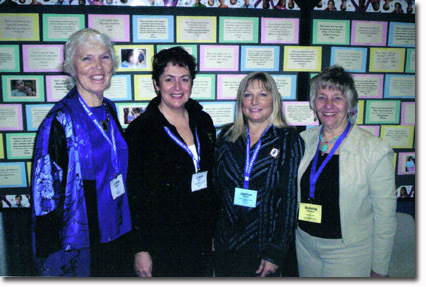 Judi Bauerlein (left) and Sonnie McFarland (right) of the AMS Peace Committee, congratulate Laure Kominar and Janice Mayhew, recipients of the "Ursula Thrush Peace Seed Grant" in front of the peace wall at the AMS conference in Washington, D.C. in March ,2008. Laure and Janice used the funds to assist with costs for traveling to Tanzania, Africa, in November to provide Montessori teacher education workshops for teachers there and to help at the Montessori school in Mbeya which serves village children and orphans at The Olive Branch for Children mission. As long-time Montessori teacher trainers we were drawn to volunteer to bring our knowledge and expertise to teachers in the Mbeya, Tanzania area and to the staff at the Montessori school of The Olive Branch for Children's Mission. It is a fledgling Montessori school that serves the orphans who live at the mission as well as some children of villagers who make the commitment to get their children to the school each day. The school charges no fees. It and the mission are supported by donations . Our plan was to teach participants how to use and prepare their own Montessori materials, providing a package of useful supplies for each of the expected 20 to 30 teachers, most of whom have very little in the way of classroom materials available to them. These teachers will then take their Montessori materials, concepts and knowledge back to their bare classrooms, spreading the vital message of peace, contribution and acceptance to the children of Tanzania. The AMS Ursula Thrush Peace Seed Grant provided $1,100. to help with some of the expenses and materials . After the announcement of the project and its support by the AMS Peace Committee at the AMS annual meeting in Washington, D.C. in March, 2008, we were quickly able to receive donations from Waseca Learning Environments, Alison’s Montessori & Educational Materials and Mtek and were very thankful for their contributions. - 28 people who had been chosen by their to villages would attend the Montessori workshop training we would provide. Following the training, they would return to their villages, and in an empty room provided by their village, they would start a Montessori school for the children of their village. This changed our focus from helping the one school at the orphanage, to helping start 10 to 14 new preschool settings for the children of Tanzania. With this in mind, we planned to spend the mornings showing the participants how to use various Montessori materials and use the afternoons to have them make materials to take back to their villages for their new schools. We took supplies for the participants to create practical life exercises like folding cloths, weaving, etc. ;sensorial exercises like matching fabrics, color tablets made from paint samples; language materials like sandpaper letters, beginning, ending and middle sound exercises, and beginning phonetic reading materials as well as classified cards of many different subjects; math materials like sandpaper numbers, bead stairs for counting, adding and subtracting, addition strip boards,various math charts, exercises; cultural exercises like matching and colouring flags, children of the world pictures to colour, etc. We also wanted to take some small size "personal" supply items such as toothbrushes, toothpaste, soaps, shampoos,etc. so sought donations of these items. Taking these additional materials required additional suitcases and additional expenses, so donations of materials and money to help with these expenses was most appreciated. Our trip was an incredible experience for me. We spent very little time with the children in the Montessori school at the orphanage, but the time we were there, there were certainly lots of very intelligent and eager ones who stood out for me. I have attached a picture of some of the children.... I was working with one little boy who knew all his letter sounds, so i began spelling with him with the movable alphabet. All of the other children wanted to get in on the activities, so they sat and watched as he spelled lots of phonetic words. I found that all the children were eager for some attention and always ready to try something new. Most of our time was spent giving a Montessori education workshop to 27 adults who came from 14 different remote villages. Working with them was as absolutely rewarding as it was frustrating. They all wanted to learn everything and were as needy as the children were, so we found ourselves pulled in all directions, listening to adults learning to read English, helping them with using scissors (they had never used them... or glue bottles, or white out, or paper clips, etc.) correcting their spelling before they made reading cards for the children, explaining instructions over and over through our translators. We found ourselves learning and using a whole lot of hand signs along with a little Swahili... and calling on our translators to rescue us when needed. These people responded to the smallest positive comment and drank up any attention they could get.... but they worked very hard to get it and produced lots of materials to take back to their classrooms. Throughout the workshop course, these adult students learned the phonetic sounds of letters and learned to read short and long phonetic words... that was a great accomplishment since only 3 of the 27 said they could read English on our first day of class. In addition, they made sandpaper letters, phonetic word cards, upper and lower case matching exercises, object matching, picture matching , colour matching, geometric shapes, bead bars for math, addition boards and charts, clocks, hundred boards, and much more, and learned how to use all of those things! With the generosity of the Alison Montessori materials company, we were able to give each of the 14 villages a movable alphabet set so they could practice spelling with the letters. They also received many other donated educational materials including phonetic readers and other books, so they were each able to fill up a very large basket with materials to take back to their villages to start a Montessori school for the 3 to 7 year olds there. The impact that each of these people will have in their villages will be immense. Instead of having the children sitting in the dirt, playing with the dirt, as we saw when we visited the villages, they will instead be able to use materials to learn to read English, to learn to count and add and subtract, and to find out about animals and people and all kinds of things around them. Montessori education again proved itself to be universally applicable and successful. In those villages where there is very little in the way of educational materials, certainly no pencils or paper beyond those we gave for the schools, the children there will be able to work and learn with laminated cards, and real objects and beads, and they will progress at their own pace just like other children around the world who attend Montessori schools. The materials will last and be available for hundreds of children and it won't matter that there are no pencils or paper. This experience at Olive Branch has been life changing for me. I was always thankful for the life I have been able to live in Canada, but seeing life in Tanzania, with the constant struggle to simply have food, water and shelter, has made me eternally grateful for all the things we often take for granted.... water, hot showers, air conditioning, good health, doctors and medicines when needed, varieties of foods, safe streets, and healthy families. all helping at various times with cutting and trimming cards, sorting cards and objects and carrying things to and from our classroom. Everyone helped and it was a great team effort to make this workshop successful.... All of the participants stayed on the Olive Branch property and Mama Sabina saw to it that they were all fed every day... no easy task while cooking on outside fires... the main kitchen is still under renovation. I was very proud of each of the adult students when we presented them with their attendence certificates at the final celebration. They were absolutely beaming with pride! They moved us to tears with their songs they sang, saying that we had taken the stupid out of their heads and replaced it with knowledge... and they were thankful that we had come to Tanzania. I hope to one day be able to return to Tanzania to see how each of the village schools are doing and plan to continue to raise funds and collect donations of materials to send to the new schools as they grow. Montessori education in Tanzania is definitely growing! Laure and I met with Deborah McCracken in Toronto and were thrilled to hear that there are now 9 schools started in the villages. Three other villages have agreed to build schools in their villages so their children can attend and be educated. That means that 12 of the 14 villages represented at our Montessori education workshop have now started or will shortly start programs for their village children. I am awed and amazed at the results of our work in Tanzania. Jamie and Pam, the two Montessori teachers from Toronto who first went to Tanzania in 2007 to provide some training for teachers, are planning a return trip to Tanzania in July-August, 2009. They will be reviewing materials and presentations we covered in our workshop and concentrating on some further language and math materials as well. Their workshop will be held out in one of the villages rather than at the Olive branch center in Mbeya. Laure and I have agreed to help them with procuring donations of materials to take with them, and I am happy to announce that Alison’s Montessori materials and Montessori Materials Company of Boston have already agreed to donate equipment for the children of Tanzania. We invite further donations of materials and funds. 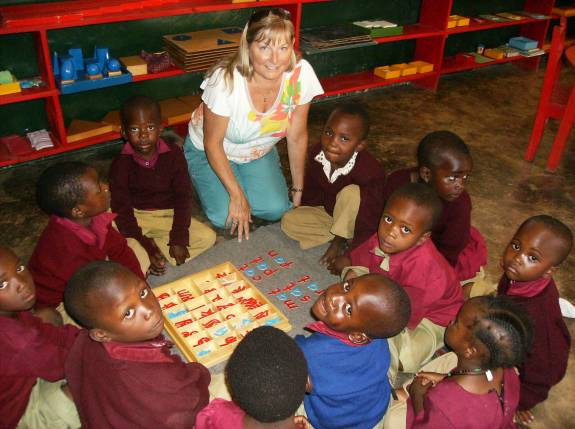 Janice Mayhew, based in Windsor, Ontario, Canada has been a Montessori teacher, teacher educator, head of school and head of a Montessori materials company.